It's always interesting to hear people who aren't British talk about the country and its history. In this dev diary, lead game designer Quinn Duffy talks about what historically set apart the British army and how that transfers to how they function in Company of Heroes 2: The British Forces. Did you know that the British army was really good at defence? I do now. According to Duffy, "once they grabbed a piece of ground it was really rare for them to be pushed off it". Unlike the Commonwealth in Company of Heroes 1, however, this British army isn't solely defensive. 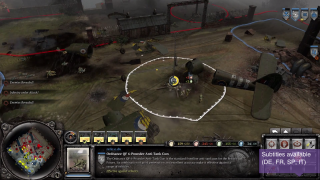 They have a tech tree in which the player can choose between offensive and defensive branches, for example a fast armoured car or an anti-aircraft gun. Of course, the way you really tell this army is British is the accents. Go to 1:25 to hear it in action. The British Forces expansion comes out on September 3. Ian's hands-on preview should give you some idea of what to expect.